A train will leave Cornwall on Tuesday as part of celebrations to mark the 200th anniversary of the birth of the engineer, Isambard Kingdom Brunel. The Penzance to Bristol train will be decorated with a picture-livery showing scenes of Brunel's rail achievements. Wessex Trains says Brunel is an icon and as big an inspiration today as he was 200 years ago. 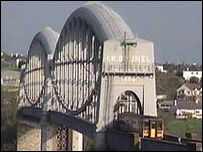 The train leaves at noon and will stop for a photo call at Brunel's Royal Albert Bridge over the River Tamar. Isambard Kingdom Brunel died four months after the Royal Albert Bridge was opened. He was 53-years-old. When the train pulls into Bristol Temple Meads station, there will be a special reception where the train will be officially named Isambard Kingdom Brunel.